In 1492, Christopher Columbus “discovered” the new World when he landed on the island of San Salvador in the Bahamas and claimed it for Spain. Later, Spanish slave traders captured native Lucayan Indians and forced them to work in the gold mines on the nearby islands of Cuba and Hispaniola. After that, all Lucayans perished within a mere 25 years. The Bahamas remained largely uninhabited until the mid-1600’s when the Eleutheran Adventurers, religious refugees from England and Bermuda, founded the first permanent European settlement in the Bahamas in 1647, giving Eleuthera Island its name. Similar groups of settlers formed governments in the Bahamas until 1717, when the islands became a British Colony. 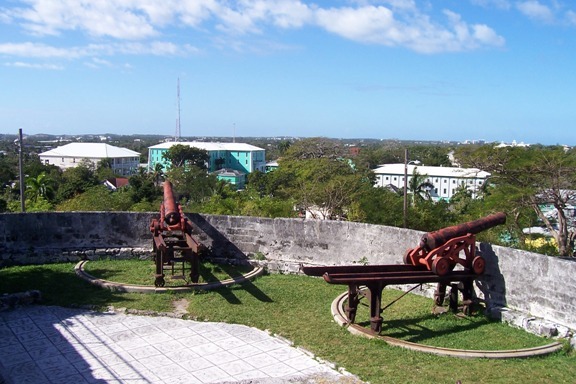 Starting in the late 1600’s, Spanish forces attacked then British settlements, and pirates, who used the Bahamas as a base, also raided the communities. The late 17th to the early 18th century was called the Golden Age of Piracy, which figures prominently in Bahamas history. Sir Francis Drake, Blackbeard, and many other famous pirates and privateers used the Bahamian islands as a base. The thousands of islands and cays with channels and dangerous shoals provided numerous hiding places for pirate ships near well-traveled shipping lanes. When the Bahamas became an official British colony, an English privateer, Woodes Rogers, became the first Royal Governor of the Bahamas. He successfully drove off Spanish invaders and ridded the colony of pirates. Spain gave up its claim to the Bahamas in 1783 as part of the Treaty of Paris. American colonists who were still loyal to Britain and settled in the Bahamas, as did new immigrants from Britain, including slaves, the ancestors of many modern Bahamians from Western Africa. This continued until August 1834, when the British Slavery Abolition Act went into effect. The white-dominated United Bahamian Party (UBP) ruled the Bahamas for decades while influential white merchants known as the Bay Street Boys" dominated the local economy. In 1953, Bahamians dissatisfied with UBP rule formed the opposition Progressive Liberal Party (PLP). Under the leadership of Lynden O. Pindling, the PLP made Bahamas history by winning control of the government in 1967 and led the Bahamas to full independence in 1973. The United Kingdom granted the Bahamas internal self-government in 1964. Full independence followed on July 10, 1973. In the early 1980’s, many Haitians began coming to the Bahamas to escape political unrest and poverty in their own country. A coalition of PLP dissidents and former UBP members formed the Free National Movement (FNM) in 1971. Former PLP cabinet minister and member of Parliament Hubert Ingraham became leader of the FNM in 1990, upon the death of Sir Cecil Wallace-Whitfield. Under the leadership of Ingraham, the FNM won control of the government from the PLP in the August 1992 general elections. The PLP regained power in 2002 under the leadership of Perry Christie, but the FNM, again led by Ingraham, returned to government by capturing 23 of the 41 seats in the House of Assembly during the May 2007 election. The next election must be held no later than May 2012.